Catalonia: better together in Europe? 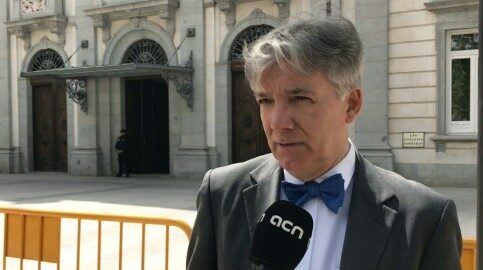 Exactly a year after the declaration of independence in Catalan parliament, the parties defending it are still reach an agreement on two large underlying matters. The first implicates what next steps should be taken, following the realisation that the Catalan Republic couldn’t be implemented as such. The second issue is whether to make the next moves as a singular, strong political movement or through separate candidacies in the upcoming elections. In May 2019, citizens will have their say on local and European votes. The pro-independence Esquerra Republicana (ERC) party is reluctant to create any joint tickets for any election, as they repeated today. This, even though an MEP for the party, Josep Maria Terricabras, suggested a Spanish-wide left-wing front, or a joint candidacy of pro-independence parties for the European Parliament election. Also Josep Andreu, Mayor of Montblanc for ERC, showed his support for the project. Terricabras further stated that Esquerra’s now-incarcerated leader, Oriol Junqueras, could lead such joint ticket. Elsa Artadi, minister for the other large pro-independence group in Parliament, Junts per Catalunya (JxCat), said today that she was open to the suggestion. Junts per Catalunya is led by former Catalan president Carles Puigdemont and they are more prone to joint tickets. In fact, on October 27, the exiled official, Artadi and others established a new platform: National Call for the Republic, or ‘Crida Nacional per la República.’ Their aim is to to create an umbrella movement gathering the pro-independence movement together – no matter whether form the left or right. But so far only PDeCAT – Puigdemont’s party – is open to joining them.